The elephants, including a pregnant female, were part of a larger herd wandering through the plantation early Sunday in Assam state, home to India's biggest wild elephant population, when they were mowed down by the train. "All five elephants died on the spot. A stillborn calf was later removed from the pregnant female," said Vikas Brahma, head of Assam's forest department. Brahma told AFP it was uncommon for elephants to move through that section of Assam, a thickly-forested state famed for its tea and wildlife, and officials were unaware there were herds in the area. Railway authorities have been issuing alerts about elephant herds passing through the state to prevent accidents. But a railway spokesman told the Indian Express newspaper that no speed restrictions were in place at the time of the accident on Sunday, as the area was not a designated migratory path for elephants. Deforestation and construction activity near their habitats force elephants to stray further afield for food, often bringing them into conflict with humans. 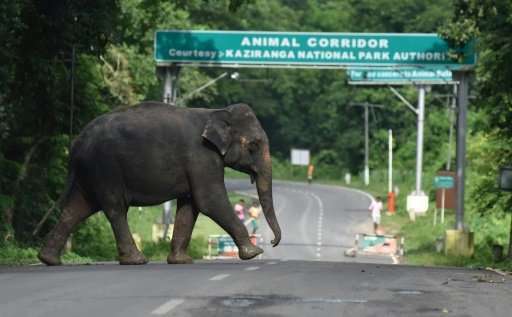 Many busy migratory routes, known as elephant corridors, have been cut by roads and railway lines in Assam and neighbouring West Bengal state, increasing the risk of accidental deaths, poaching and stampedes. Assam has 5,620 elephants according to a 2011 census, more than any other state in India. An estimated 60 elephants have died so far this year in Assam, Brahma said. Many of the deaths were caused by electrocution, as farmers erect electrified fences around their fields to keep wild animals away. Elsewhere, an elephant killed a trainer during a procession at a Hindu temple in the southern state of Kerala on Sunday. The elephant ran amok amid a large group of devotees, trampling and killing the trainer, the Press Trust of India reported.